I’ve been using this book as a text for my Intro to Theology class for several years, and I continue to love it. The book was designed for use in adult education in a church setting, but it works very well for my students. I like to use a lot of primary texts and academic articles in my teaching, which can be challenging for some students, especially at the introductory level. This book is the reassuring complement to those texts. McIntosh speaks with a winsome, accessible voice, using lots of great illustrations. He helps even the most insecure student feel comfortable doing theology. And I love the theology he presents in this book. 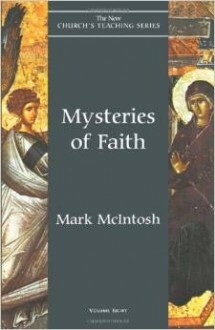 I teach my intro class through the lens of theological aesthetics, and McIntosh’s approach fits well with that without exactly duplicating it. He uses a lot of Traherne, which makes me happy. He’s a calm, consistent voice for students to hear throughout the semester, introducing every major subject in a very approachable and yet covertly sophisticated way. I don’t agree with him in every place, which is also good, since a textbook that completely agrees with the teacher can be oppressive. But I agree with him enough to trust him with my students’ faith. I know that Mark McIntosh has also written a textbook designed for introductory theology classes at the college level (Divine Teaching: An Introduction to Christian Theology), and that’s a nice book too. But it’s a harder read. If I switched to it I would have to leave aside some of my primary source readings, because students wouldn’t be able to get through the textbook plus something even harder. By contrast, the chapters in Mysteries of Faith can be read quickly enough that I can add them onto another reading without feeling that I’m overloading my students. I just hope it continues to be available. Since it’s been released for the Kindle, I trust that at least the electronic version will stay in print.